The much-anticipated Josh Allen starting debut went about as expected. He looked a lot like a rookie quarterback. But he got no help from the Buffalo defense in a 31-20 loss to the Chargers. 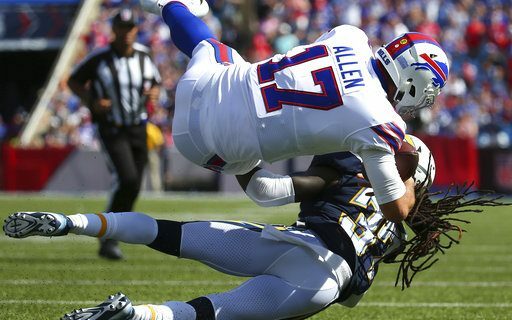 Allen’s game was typical of what his season will look like. Some good throws. Some good, athletic plays. Some “Wow” throws that make your gasp. But there were a lot of mistakes that made every Bills fan gasp in frustration. He held the ball too long, missed open receivers, took 5 sacks and couldn’t anticipate the blitz. His 18/33, 245 yards, one touchdown and two interceptions stat line is pretty typical of a rookie quarterback. But there is enough there to be excited about. Brian Daboll’s offense designed some plays to take advantage of Allen’s skill set. I loved the first drive of the second half, when they had Allen run the ball on three straight plays. I don’t love having your QB run at all. It’s not how you win in the NFL, and it’s not how you keep him healthy. But Allen’s confidence needed a boost, and using his legs provided that. The matchup against Phillip Rivers was a bit cruel for Bills fans. Allen reminds me of Rivers, and it goes beyond the number 17. They are physically similar, and appear to have a certain moxie that makes a QB successful. If Allen can approach what Rivers is now, the Bills will be fine. *The defense is supposed to be the strength of the team, but it’s been far from that so far. 78 points allowed in two games is a joke. The Chargers and Rivers went right through them, scoring on four straight drives in the first half. Rivers was 23/27. Especially with a rookie QB, the Bills will need the defense to win some games. So far, that looks like it will not happen. *The Bills offensive line was bad again. The Chargers knew that the Bills wanted to use Lesean McCoy to make life easier for Allen. The problem is, the Bills O-Line isn’t good enough to impose any will on a defense to get a running game going. McCoy had 27 yards on one run, 12 yards on the other eight runs. *The Vontae Davis halftime retirement is one of the most bizarre events in Bills history. We know the groin injury was lingering, and probably made the ten year veteran wonder if could still play at a high level. But to disrespect your team that way is incredible. Expect the Bills to release him Monday or place him on a retired list. It’s another miscalculation by Brandon Beane in a desperate attempt to upgrade a position. E.J. Gaines isn’t so bad anymore? Now the Bills are in big trouble at cornerback. Complete reaction and analysis of the Bills game all week long on the Sylvester & Peck On Sports Podcast.